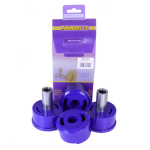 PFR32-410 Rear Lower Wishbone Front Bush features tapered voiding to allow a controlled amount of movement and is made using our Shore 80A Purple material. Powerflex's special polyurethane is an advanced material with unique properties. Upgrade your Land Rover ~ Discovery 3 (04-09) with high performance bushings, bushings that won't cause vibration or noise and include a Lifetime Warranty!